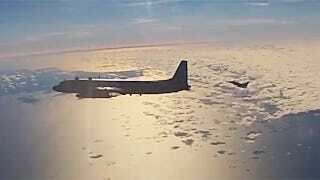 This video shows what it looks like to intercept a Russian IL-20M electronic intelligence collection aircraft, high over the Baltic Sea. The Royal Air Force Typhoons that were scrambled on August 17th to intercept the aircraft were launched out of Estonia as part of NATO’s rotating air defense mission in the Baltics. Although many Russia-NATO intercepts have made headlines for aggressive actions or near collisions, the majority occur in a peaceful manner just like the one below. Intercepts of Russian aircraft near or over Europe have increased drastically since Russia invaded Crimea in early 2014. Even though the geopolitical divide has increased between NATO member nations and Russia, and fears of Russia bringing its ‘hybrid warfare’ tactics to destabilize the Baltic States, NATO is decreasing their air policing mission in those countries.